Miami Trace freshman Alexis Gardner exeuctes a straddle jump during her floor exercise routine. All Around placings (l-r); Devan Thomas (M.T.) second; Lizzy Valentine (Greeneview) fourth; Kandice Mathews (M.T.) seventh and Maddy Southward (M.T.) eighth. Washington junior Aria Marting performs a ring leap on floor. Lizzy Valentine, a sophomore at Greeneview High School, performs a straddle cut skill on uneven bars. 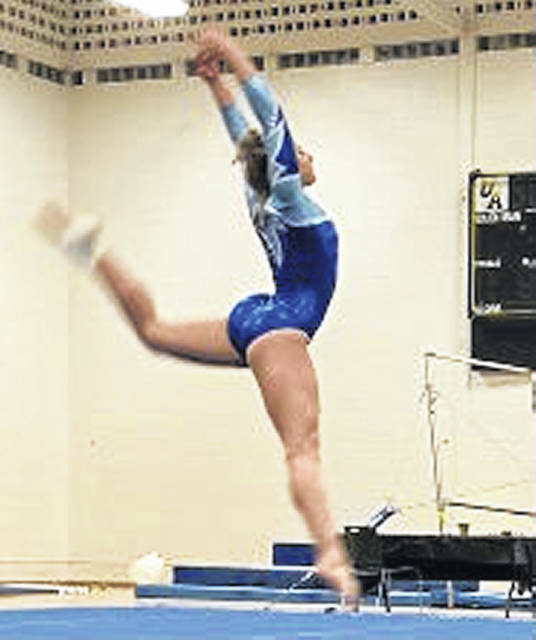 Greeneview and Miami Trace gymnasts flipped their way into ranking at the award placing concluding the dual meet with Upper Arlington Tuesday, Feb. 5. 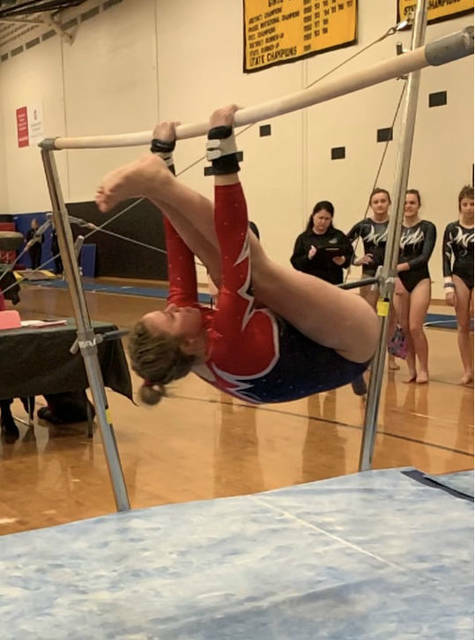 Miami Trace varsity gymnastics team, along with independents from Washington High school and Greeneview High School competed against Upper Arlington. The Golden Bears won the meet with a team point total of 126.15. Miami Trace raised their overall team score to a 118.4 mark. Devan Thomas led Miami Trace in each of the apparatus events. Thomas placed second in the all-around (32.85). She was second on uneven bars (7.7) and balance beam (8.65) and finished third on vault (8.15) and third on floor exercise (8.35). Lizzy Valentine of Greeneview earned three new personal best scores achieving placings in the awards. Valentine stood as vault champion performing a new skill, (8.25). The sophomore standout was third on uneven bars (7.3) and fourth on both balance beam (8.0) and floor exercise (8.3). Freshman Milana Macioce competed her best meet thus far with a personal high mark on bars (6.6) and with her performance on floor (7.25). The Panther gymnasts boosted their event scores as a team on vault (32.4) and on bars (25.9). Washington junior gymnast Aria Marting debuted her brand new choreographed floor routine earning an awarded score from the judge of 7.55. The group will be back in action Thursday when they travel to Miamisburg. https://www.recordherald.com/wp-content/uploads/sites/27/2019/02/web1_Alexis-Gardner.jpgMiami Trace freshman Alexis Gardner exeuctes a straddle jump during her floor exercise routine.